I think I'm definitely one of those people who feels like they should have been born in another decade. The problem is I'm not exactly sure which decade. I often watch TV shows set in the 1960s, such as Madmen and The Astronaut Wives Club, and in terms of fashion, I feel like I would fit in perfectly. As I've said before, I long for the days when people wore hats out in public and ladies donned gloves to go to the airport. Sure, it's a little bit more of a hassle to get dressed up or to put on makeup, but I honestly do feel a little better about myself when I do so. I wore this dress that looks like it is straight out of the 1960s last week to go out with my husband to go to a Mexican restaurant. It's a pretty casual restaurant, but truth be told I was anxious to find somewhere to wear this dress before the end of summer. My husband joked that it would be more appropriate in a Polynesian restaurant, but unfortunately my favorite Tiki restaurant closed down several years ago, so that's not really an option! The only thing that bugs me a little bit about styles from decades past is how matchy-matchy everything had to be. For example, the preference to match your shoes to the exact shade of your purse. While I think there is something still chic and timeless about this coordination of colors, it's also fun to spice things up a little bit. 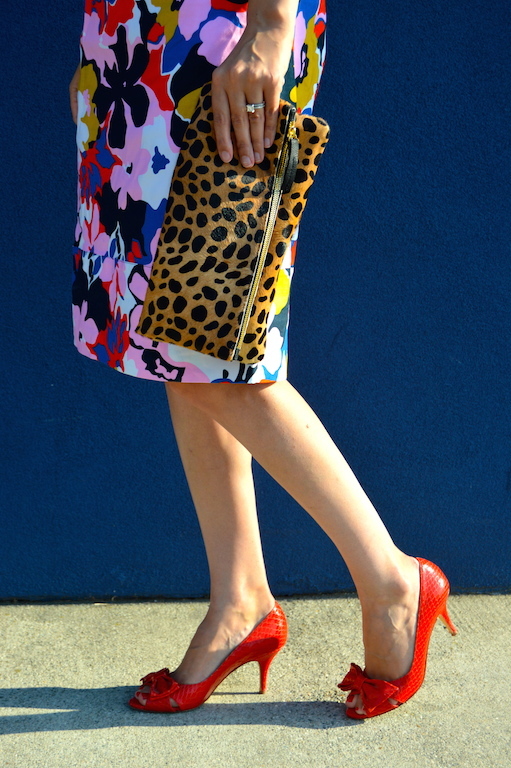 For example, here I paired a leopard clutch with a dress that already contains a bold pattern. 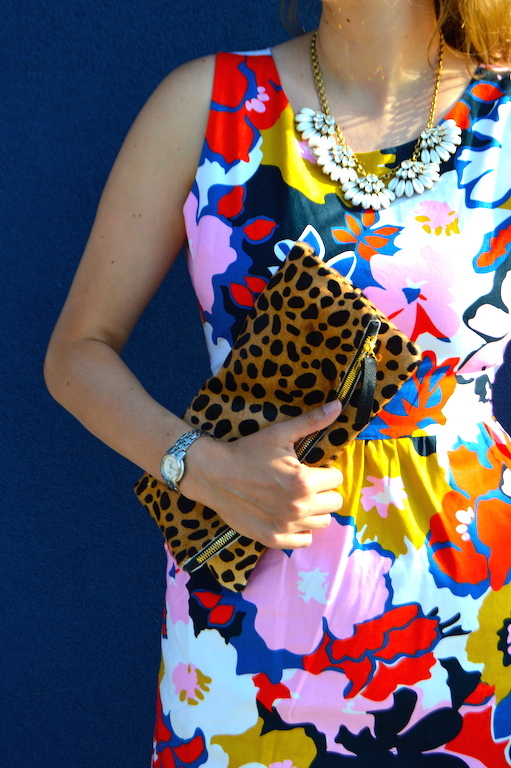 I never would have imagined at the time of purchasing this leopard Clare V. Clutch that I would get so much use out of it, but I wear it all the time and it seems to go with everything. Even though there might be some disagreement about the neutrality of leopard, I definitely think every woman should have at least one leopard clutch or bag in her wardrobe. Here are a few of my favorite leopard bag options for fall that could be paired with a funky floral print like the one I have on or a more neutral color palatte depending on your personality or whim for the day. 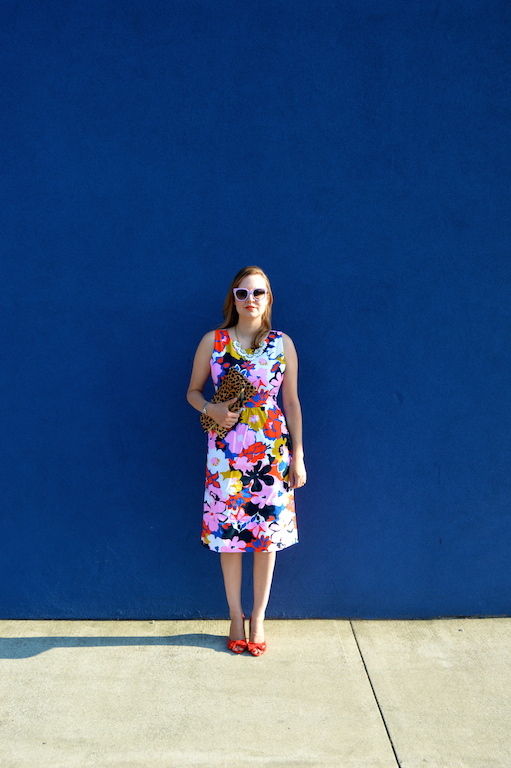 Gorgeous dress -and I love how you paired it with this Mod sunnies! Such a perfect retro look! Thank you Lee! I thought it would be the perfect occasion to wear my purple, retro sunnies! Vintage fashion is always cool, but I definitely have a soft spot for the 50s/60s. I love that so many styles today refer to these decades. Your luncheon parties sound amazing! I am all about creating an excuse to get dressed up! It's so fun that you even wore gloves and hats. Maybe I should start something like this! Gorgeous dress! I love the retro vibe! That clutch looks so fabulous with the floral. Leopard is totally a neutral in my book! I'm glad I've found others who agree that leopard is a neutral. Now if I could just get my husband to see the light! Thank you! I always love floral paired with leopard! What a great print! I'm a huge fan of bold prints! I love that you added the leopard print clutch! Bold prints are the best! I think the 60s were such a great time for these types of prints and patterns. Thank you! A few years ago I would never have thought of this combo, but blogging has helped me be more adventurous. Yes, I just watched the finale of "Astronauts Wives Club" before putting this outfit together so I think I was definitely inspired by the show! Thanks for hosting! Very pretty floral dress and I like how you choose a solid blue wall to juxtapose with the pattern of the dress. I'm a big fan of finding a bright colored wall in order to show off a print like this! Thanks for stopping by! Very pretty look and I love the pattern mixing! Thank you Brooke! 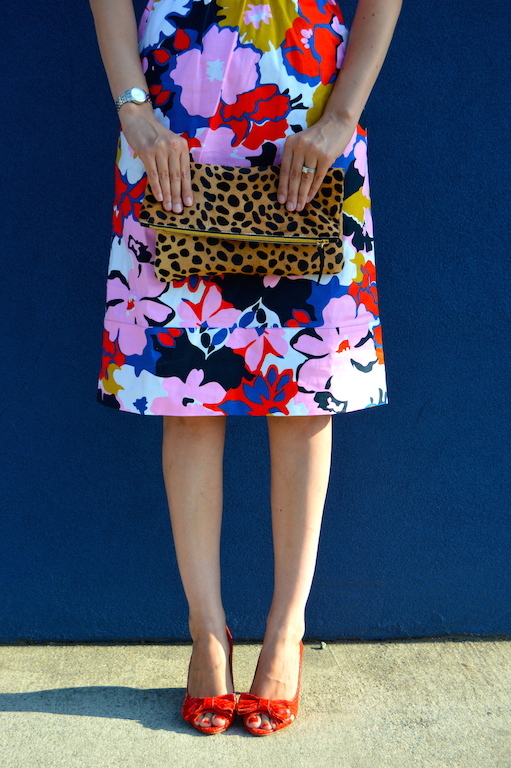 It's fun to pattern mix especially with floral and leopard. You're too kind, Kim! The nice thing about blogging is you can choose to highlight just the "amazing" days and leave everything else out! I hope you have a fabulous rest of the week. I think I have a toe in several decades! 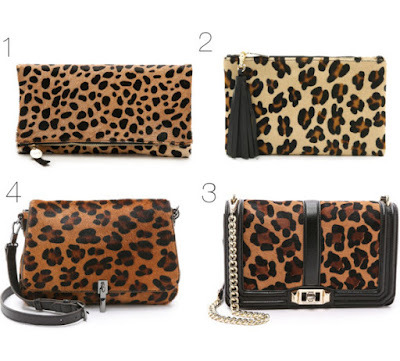 So right to choose the leopard print clutch. Ramps up the X factor. Made me smile that your husband thought it was more suited for a Polynesian restaurant! and I'm totally with you on squeezing in outfits before the summer goes. The dress deserved a spin before hibernating for the winter. Thank you! My husband usually has an opinion (good or bad) about everything I wear, usually the opinions are pretty humorous. Ooh that dress is so much fun!! I'm glad you found a place to wear it, because it's such a fun piece--love the mix of prints here too! Thank you! The dress was also a great price too. I actually bought it the day I wore it out. I guess that just shows how anxious and excited I was to wear it! Katie, I adore the colors and style of this dress. I say this to my hubby often, that I wish I could turn back time and be in the 50s-60s, at least it is perceived that is was an easier time then, and clothes were awesome. Love your bag too! stunning dress! 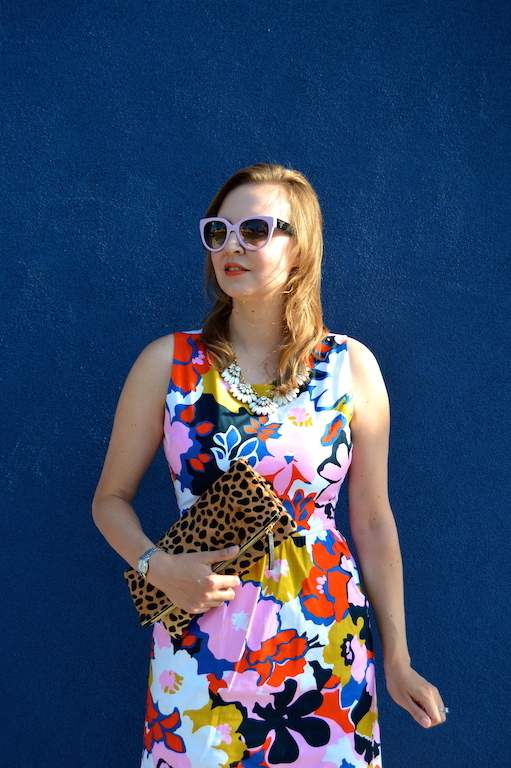 I love the print mixing you did! I loved the fashion of the 60's and I guess you are right, things had to be pretty matchy, but I love your unexpected leopard purse pairing.